NAIROBI, Kenya (CNN) -- Somali pirates have released a Togo-flagged vessel that was seized last week, the World Food Programme said Monday. 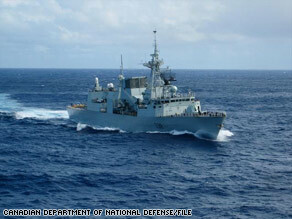 The Canadian navy's HMCS Winnipeg helped foil a pirate attack on a Norwegian tanker Sunday, NATO says. Pirates on four skiffs seized the 5,000-ton MV Sea Horse on Tuesday. "We hear from the operators of the ship that it was released on Friday," said Peter Smerdon, spokesman for the World Food Program in Nairobi. The ship was not under U.N. charter at the time of the hijacking. But it was on its way to Mumbai, India, to inaugurate a new route for the organization to deliver food from India to Mogadishu, Somalia, Smerdon said. Piracy is rampant in the Gulf of Aden off the coasts of Somalia and Kenya with vessels seized regularly and often released only after a large ransom is paid. Despite the presence of foreign navies off the coast of Somalia, securing the 1.7 million square-kilometer (1.1 million square miles) region has proved difficult. At any given time, a number of nations could be in the region to protect the seas. Though the countries try to coordinate efforts, there are limits to the extent of information they share. On Sunday NATO said it had foiled a weekend pirate attack on a Norwegian tanker. Pirates attempted to capture the MV Front Ardennes at 6 p.m. Saturday and were apprehended seven hours later, Commander Chris Davies told CNN. A NATO-supported Canadian navy ship, the HMCS Winnipeg, was returning from escorting a World Food Program vessel in the gulf when it saw the Norwegian ship under attack, Davies said. A British Royal Fleet Auxiliary vessel, the Wave Knight, was also in the area. On Saturday, Dutch naval forces also captured seven pirates and freed 20 captive fishermen after tracking the pirates to their "mother ship" in the western Gulf of Aden. The rescue came as pirates were capturing another vessel -- a Belgian ship -- off the coast of the Seychelles islands.